Bettini Beef Pastoral Group general manager Mark Bettini said in his 30 years in the Pilbara, the worst locust plague he had seen was in 1998 at De Grey Station, 100 kilometres east of Port Hedland. "Last year they were pretty bad, I'd say as bad as this year - but this year they've done more damage because we haven't had the follow-up rain. "In some years they'll hatch out, but you'll get a big wind or a cyclone or a really big weather event which will probably kill a few and thin the numbers out a bit but that just hasn't happened this year, so they've had a good go." The exact cost for landholders is hard to estimate, but it is likely to be in the tens of thousands. "You'd have to think that (the cost) would be somewhere in that vicinity, because we did have a fair bit of grass before they came in some areas, and in some areas there's just stalks left," Mr Bettini said. "The cows aren't going to put on the condition that they normally would have so we'll have to change our management." Once locusts grow wings, numbers are very difficult to control. Department of Primary Industries and Regional Development entomologist Svetlana Micic said pastoralists should assess the cost the insects were having before they considered chemical controls. 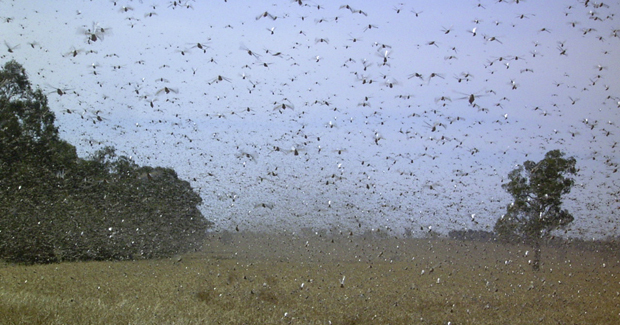 "Once the locusts are winged and flying, the only effective control mechanism is to aerially spray them," Ms Micic said. "But when you do spray you do need to bare in mind that you can have re-invasion." For Mr Bettini, it was not worth the outlay. "You could go and spend thousands of dollars a hectare trying to spray them, but are you going to make that money back? Probably not," he said. In the meantime, Mr Bettini said he would consider ways to make money back from the locust plague.